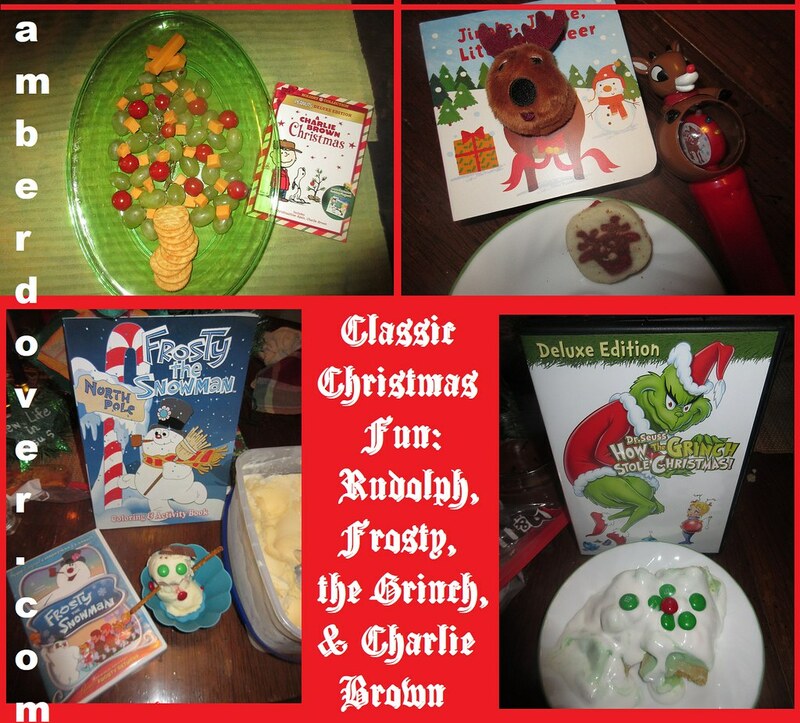 In this post: Fun and food with classic Christmas characters! Also, a special story from our friend, the Grinch! Charlie Brown Christmas- Linus knows what Christmas is all about. It is not a season to worship commercialism. No, Christmas is about the birth of Jesus and simply love. Even a tiny tree can sparkle when it’s showered with kindness! Christmas Tree Platter and cookies! Grapes, cheese, tomatoes, and crackers! Yummm! I love Pillsbury sugar cookies! An Outdoor Movie! It was just warm enough for us to watch the movie outside on our big screen. Little Debbie Christmas Tree cakes for another dessert! Rudolph- My favorite thing about Rudolph is how he and others learn to be themselves. When they stop trying to be like others, the characters really shine and save the day! It’s also a story against bullying. A reindeer puppet book, reindeer sugar cookies (Pillsbury again), and a light up spinning Rudolph wand. A Rudolph coloring book from the dollar store. We watched this movie inside when it came on tv. Frosty the Snowman- The Magician learns to treat children (and snowmen) kindly. This is a sweet story of childhood innocence and faith. It has become a tradition to have snowmen ice cream sundaes as we watch Frosty. Felt Snowman Kit from Hobby Lobby. Instead of gluing the snowman together, I decided to leave everything loose for play. The Grinch- This delightful tale is about a grump who learns to care. Christmas doesn’t come from a store…maybe it is something more (not the actual quote). Grinch Pie– Pistachio pudding pie with whipped cream and M&Ms. I used just one red M&M to represent the Grinch’s heart. Pin the Heart on the Grinch– Another family tradition. Leeland was able to participate this year :). Our friend, Sam, reading The Grinch and being the Grinch.